The Petre Shotadze Tbilisi Medical Academy, commonly known as Tblisi Medical Academy was established in the year 1992. The academy was founded by professors Dmitry Tsverava and Peter Shotadze. After the death of Peter Shotadze in 2000, the academy was named after him. Tbilisi Medical Academy is the oldest private institution of higher medical education in Georgia. TMA is a self-governing institution and is run by highly qualified academic staff. The duration of the MBBS course in Tblisi Medical Academy is 6 years which includes one year internship. The medium of instruction in TMA is English which is a plus point for the foreign students. The degree obtained from TMA is recognized all over the world. Tbilisi Medical Academy has many experienced faculty members including the academicians of National Academy of Science of the Georgia, New York Academy of Natural Sciences, International Academy of Information, and Academy of Natural Sciences of the Georgia, 50 Full Professors and Doctors of Medicine, 100 Associate Professors and PhD Doctors, 50 Masters. Tblisi Medical Academy provides a remarkable practising experience to the students at the University Clinic of the Academy. “St. Joachim and St. Anna’s Medical Centre” is the base for clinical development and education for Tblisi Medical Academy. This Centre was started in October 2012 having a capacity of 88 beds. The clinic has modern technical equipment and is completed with professional staff. There are many departments in the center that include the departments for Obstetrics-Gynecology, Surgery, Neurology, Critical Care, Women’s Consultancy etc. The students can engage in clinical life at the center from first steps of their education at TMA. Thus the learning in TMA is not just limited to books and classrooms, but the students are provided with complete hands on training and clinical experience which helps them in improving their skills and gain more practical knowledge. The cost of living in Tblisi is very low with good infrastructure and facilities. 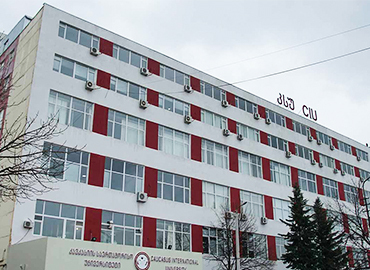 At present more than 1000 students are studying in Tblisi Medical Academy. The sprocess of admission in TMA is very simple and hassle free. The students are not required to take any entrance examination for getting admission in TMA. For application, the student must have passed the 12th standard in OCB with a minimum of 50% marks. The students studying in TMA are provided with all the basic facilities in the TMA campus and that too at a very affordable price. The hostel of TMA is equipped with aal the basic amenities that include 24 hour hot water supply, electricity, Internet connectivity, separate study rooms, a library and two kitchens with the modern gadgets. The academy has a large library with more than 2000 books and study material for students. The students are encouraged to take part in many activities like sports, cultural festivals, seminars, conferences etc. TMA offers a very healthy and friendly environment to the international students.